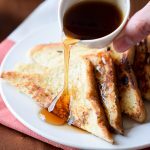 Classic Country French Toast recipe with simple ingredients is quick and easy to whip up and makes a perfect, yummy breakfast. Top with butter, maple syrup, whipped cream, or berries. Preheat a medium skillet or griddle over medium-low heat. In a shallow bowl, whisk together eggs, milk, vanilla, and salt in a large mixing bowl. Add butter to the skillet or griddle and allow to melt. While butter is melting, dip bread in the egg mixture, covering both sides. Place dipped bread onto skillet with butter and fry on each side until golden and cooked through, usually about 1-2 minutes on each side. Serve warm topped with your favorite toppings such as butter, maple syrup, berries or whipped cream.